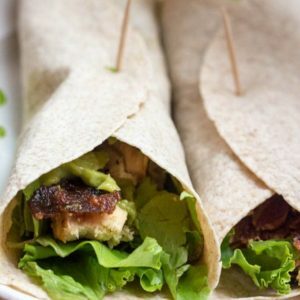 This recipe is 6 SmartPoints per serving, 1 wrap. In a medium non-stick skillet, spray the olive oil and add the chicken cubes. Season with salt and pepper and cook for about 8 minutes, turning occasionally until cooked through. Set a burrito sized tortilla on a plate and spoon 1/4 of the cooked chicken, 2 Tablespoons guacamole, 1 slice of the crumbled bacon. Top with lettuce and tomato.